#PTO2018 Conference Proposals Submission Deadline Extended to Jan 15th! 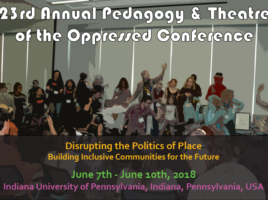 If you haven’t submitted your proposals for the 2018 Pedagogy and Theatre of the Oppressed Conference, you’ve still got time! We’ve extended the deadline until January 15th.